Renault Group is on a mission to cut is carbon footprint 6% by 2022. 60% of the parts in Renault’s supply chain travel by sea at some point and many of its finished automobiles are transported by ships as well. It is partnering with Neoline to build two experimental roll-on/roll-off car carriers powered by sails. Each will be 446 feet long and carry more than 45,000 square feet of sails. 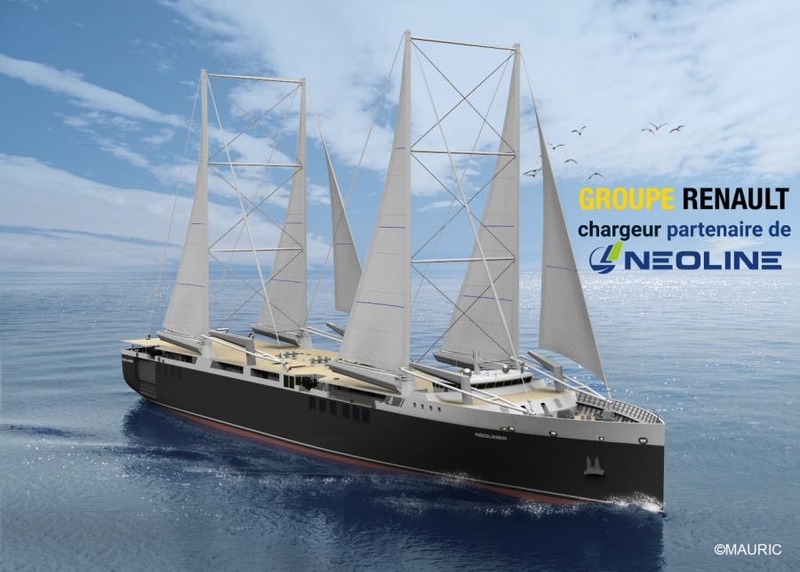 Renault has selected Neoline as its partner for this venture, a company composed of “a group of Merchant Navy officers federated by Michel Péry, captain of ro-ro ships, convinced that the climatic challenges would lead the shipping world to consider new propulsion methods to improve their environmental performance. What unites them is the conviction that the working sail is the only truly sober, immediately available and powerful enough to propel cargo ships,” according to its website. If Renault can prove sails help lower emissions from cargo ships while delivering on-time performance, look for the ocean cargo operators to take a fresh look at using sails to help power cargo ships, which as a group have more carbon emissions than any other vehicles in the transportation sector.